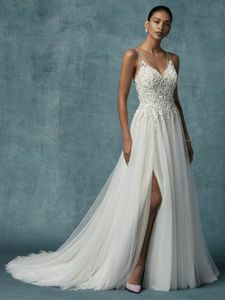 Description: DESCRIPTION Unique beaded lace embroidery and pearls adorn the bodice of this A-line wedding dress, completing the illusion V-neckline and illusion open back. Voluminous skirt comprised of tulle, featuring a thigh-high slit. Finished with pearl buttons and zipper closure.